Enjoy a delicious meal and raise funds for the Lloyd Center for the Environment! The Lloyd Center has been selected for NOT YOUR AVERAGE JOE’S “NOT YOUR AVERAGE CAUSE” program for the month of July. How it works: Every Tuesday throughout July, (1st, 8th, 15th, 22nd, & 29th) Not Your Average Joe’s will donate 15% of all purchases made by Lloyd Center for the Environment supporters at Not Your Average Joe’s in Dartmouth. 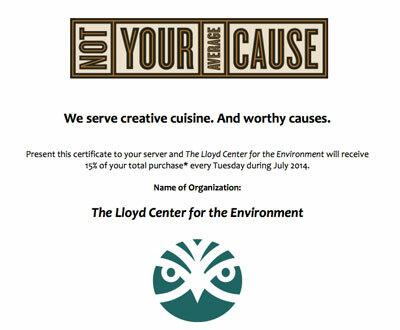 Lloyd Center for the Environment supporters identify themselves to servers with Not Your Average Cause certificates. This can be in the form of an email on your smartphone or a printed certificate (attached). If you do not have either with you, just tell your server that you are there in support of the Lloyd Center for the Environment which is July’s “Not Your Average Cause”. Please forward this email or print certificates (PDF File HERE) and hand them out to your family and friends. The more Lloyd Center for the Environment supporters who participate, the more money Not Your Average Joe’s will donate to our cause! Thank you for your support!